The perks page has now been completely redone and a total of 15 perks have been added, some with their icon too. The perk structure has changed a lot when compared to Modern Warfare 2. Your characters appearance is now tied to slot 1 perks, e.g., the Flak Jacket makes your character wear armor. 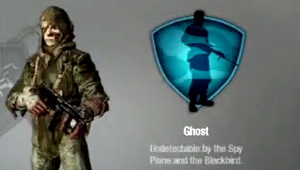 Modern Warfare 2 veterans will be pleased to hear that the Commando, Stopping Power, One Man Army and Danger Close perks have been removed from COD7. Pro perks will be returning. Click here to see the perks.